Hi! Thanks for scanning my QR Code! Or maybe you stumbled across the site randomly, or by clicking on a tweet link. Regardless of how you got here, welcome! Well, here’s what you get: a special greeting from @tradeshowguy (that’s me) Tim Patterson. I blog about tradeshows, and how to bring home more leads and create more awareness by using tradeshow marketing. 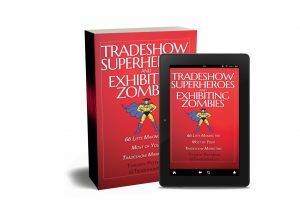 I released a book in 2015 called Tradeshow Success: 14 Proven Steps to Take Your Tradeshow Marketing to the Next Level. You can pick it up on Amazon.com, or get a free digital copy when you opt in to our newsletter here. I started in the tradeshow industry in 2002 with Interpretive Exhibits in Salem, Oregon. The owner retired in mid-2011, which is when my partners and I launched Communication One Exhibits. We’ve since morphed the same company into TradeshowGuy Exhibits in a re-brand to better match our online presence and how we’re known in the marketplace. We’re a tradeshow strategy consultancy and project management firm. We serve companies with the desire to use tradeshow products and services to help more efficiently market their brand and increase customer awareness, leading to increased profitability. We help create best-in-class tradeshow exhibits and render expert tradeshow marketing support. We work with Classic Exhibits in Portland, Oregon; Orbus and Optima Graphics and other suppliers, designers and fabricators as needed. And if you’d like to access our brand new @Tradeshowguy Exhibitor’s Toolkit, just click here! Great to meet you at EXHIBITOR 2012!